Where Do Bass Go When Released? After fishing in a few Bass tournaments in my local club, I had the idea of fishing the area around where the hundreds of fish were released after the weigh in. I figured, if they are releasing all these bass averaging two plus pounds right there, shouldn't they still be around the area for the next tournament? It turns out that the answer seems to be the contrary. Two different studies, focusing on small and large mouth Bass, have determined that a lot of these fish actually make it back to where they came from. Harkness Laboratory of Fisheries Research in Ontario placed tiny transmitters into eighteen different small mouth Bass, and released them four miles away from the area they were caught. Each one of the transmitters emitted a unique frequency to distinguish the different Bass. 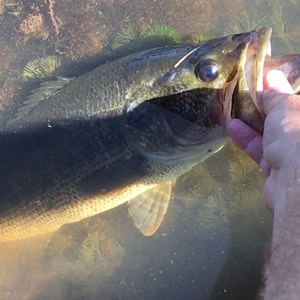 Fifteen of the eighteen bass returned to their home. The trek took around four days, swimming one and a half miles per day on average. With the other study on large mouth Bass, biologists used a much larger sample of eighty two fish on Chesapeake Bay in Maryland. These fish were released over ten miles away from their catch sites. Only thirty four made it back to their original location. But, what was interesting is how the water temperature determined how fast they made it back. In the colder water the bass took almost a year, but the fish released in warmer water made it back in a couple months. So, the chances are slim of landing those tournament Bass again close to their release point. But, if you know what direction they're headed, you might get lucky and land one on its way home.